We recently held our bi-annual quilt exhibition, but due to numerous family illnesses, I have not had the chance to post any pictures yet! 1) I love white glove duty! Getting to lurk? Quietly following around groups of people that know a bit about quilting, or just have strong opinions on what they like is really entertaining. 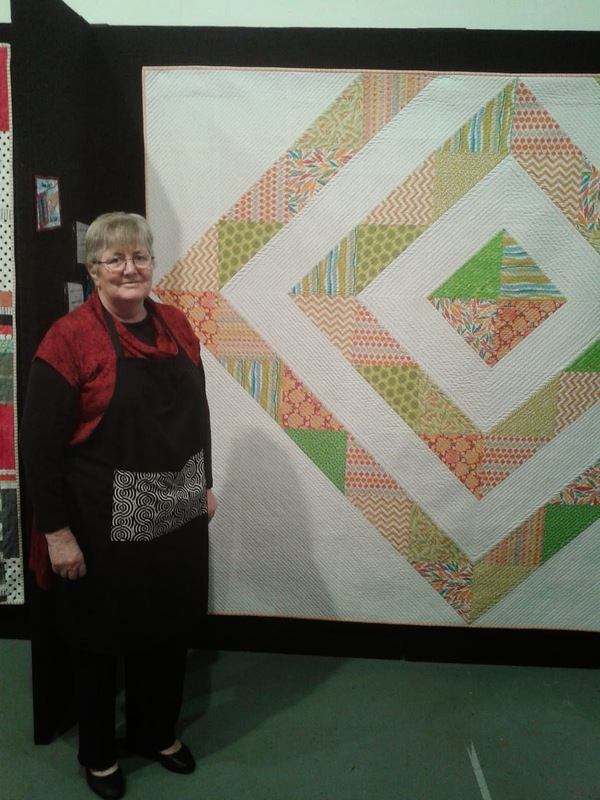 I loved listening to the conversations of people and getting to look at the quilts on show with new eyes. 2) The battery on my camera was nearly dead (yes I forgot to check). These photos were taken really quickly and with no flash, so they are mostly bad photos - sorry! This is not a juried exhibition (no one is pre-judging the quilts that get hung for a "good" show). Every paid up member of the guild has the right to have a quilt shown regardless of skill level. That is great for those of us that get daunted by the guild heavy-weights! We also did not have a lot of hand work on display, which means I was a bit gutted I chickened out of putting my Mustard Madness quilt in as well as Fente Hunts. Enough of the talky bits, these are just the quilts that spoke to me. And last but not least, our family contributions. Hope you like my little snapshot.